Press release is given as under. 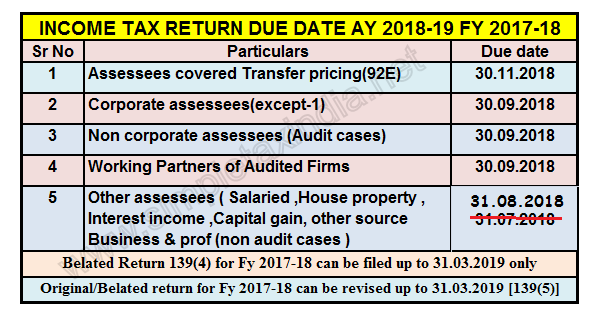 The due date for filing of Income Tax Returns for Assessment Year 2018-19 is 31.07.2018 for certain categories of taxpayers. Upon consideration of the matter, the Central Board of Direct Taxes(CBDT) extends the ‘due date’ for filing of Income Tax Returns from 31st July, 2018 to 31st August, 2018 in respect of the said categories of taxpayers. 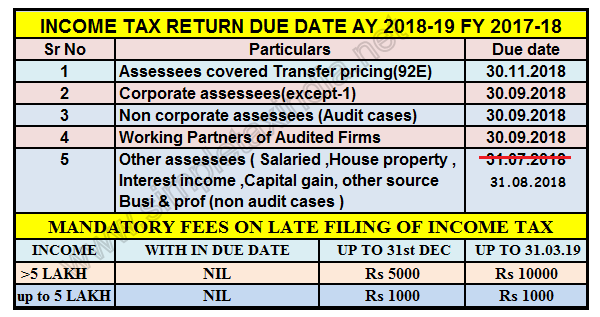 It is pertinent to mention here that if return is not filed with in due date then late fees of Rs 5000 is applicable which may extended further to 10000.